Frank Kobuszewski is vice president of the technology solutions group at CXtec. His opinions are his own and do not reflect those of CXtec or IDG. Complete infrastructure life cycle management that includes secure IT asset disposition (ITAD) and third-party maintenance (TPM) can help you maximize value at every stage of your technology investment. I was recently reading some responses to a question posted on the Spiceworks community forum that asked, “How do you dispose of old hard drives?" While there were some typically humorous responses, such as use them as target practice, smash them with a hammer, or drill a hole through them, I assume those comments were in jest. If not, those respondents are missing out on a great opportunity to get money back for their used equipment. It also reminds me of the need for safe, secure IT asset disposition (ITAD) services. It’s imperative to find an ITAD provider that offers data sanitization and destruction services that protect your company’s data integrity and privacy, handles your gear in an environmentally responsible way, and can also save your company money. They also struggle with the legal repercussions, the threat to their company’s brand reputation, and the financial impact of a security breach that are all too big to ignore. Finding an ITAD partner that can handle your company’s needs, at scale, anywhere they are located in the world is paramount. A good partner must also provide data wiping and data destruction services to ensure your company’s sensitive information is protected. And they need to provide maximum value for your assets. Proper environmental IT asset disposition practices are no longer a luxury; they’re a necessity. According to the National Institute of Standards and Technology (NIST), dumpster diving for improperly disposed media is a huge source of illicit information that puts businesses and clients at risk. But when decommissioning and data destruction is done correctly, your organization’s data integrity is safe, your budget gets the much-needed boost, and you get peace of mind. With that in mind, a critical step in the life cycle journey is to find the ideal maintenance support offerings. A common mistake many organizations make is to fixate on original equipment manufacturer (OEM) support, not realizing they have options at their disposal. The key is finding a way to right-size your support solution to meet your organization’s unique needs. Employing a hybrid support model can allow your organization to do just that. 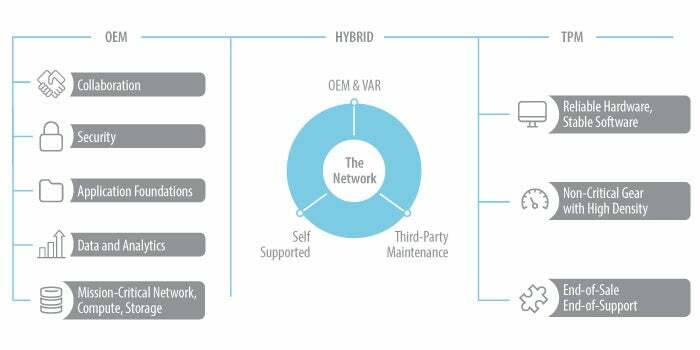 Building a hybrid support model means using a combination of OEM support, third-party maintenance (TPM) offerings, and a spares program to provide coverage for your technology infrastructure. Understanding each of these elements and what its role should be in your company’s support strategy is imperative — especially when your job is evaluated largely on your ability to minimize downtime, keep costs low, and use technology investments to support business growth. A well-designed hybrid support strategy allows your organization to choose which options provide the best coverage for your company’s technology infrastructure, while making the most of your company’s operating expense (OPEX) budget. This table indicates that both OEM support and TPM have their ideal technology focuses. This chart provides some guidelines around the types of technology that can be supported by each. For your company’s more mission-critical areas, featuring high-end compute systems, such as collaboration, security, application foundations, and data and analysis, OEM support may be the best option. For non-critical areas, such as high-density gear at the edge, devices with reliable software, and end-of-sale/end-of-support gear, TPM can be a much more sensible economic option. 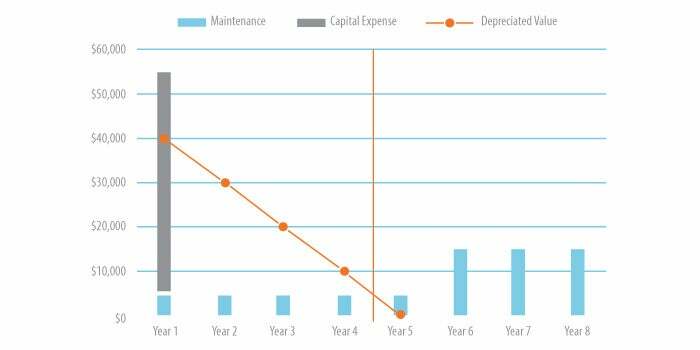 This graph shows the depreciating value of the hardware over its lifetime, compared to the cost of OEM maintenance. As the OEM’s planned obsolescence of the gear approaches, the price of support increases. 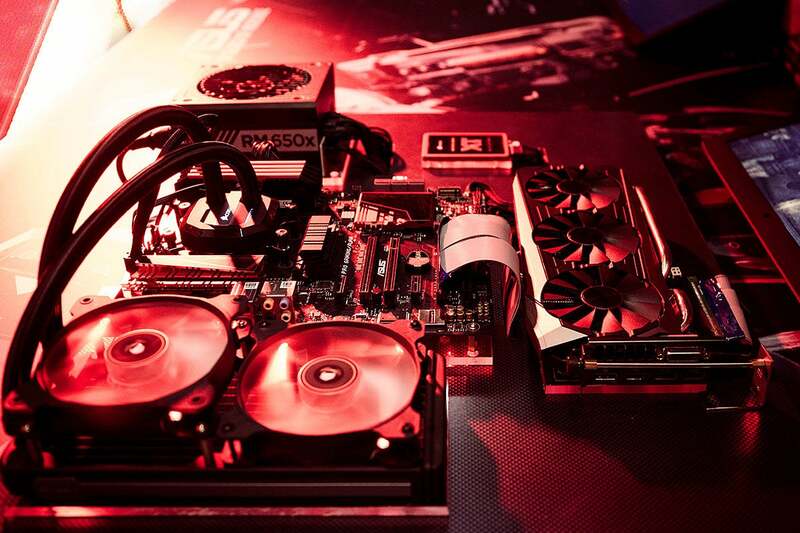 At this point, many times the maintenance plan costs more than the hardware it’s supporting. “Third-party maintenance contracts will offer customers an average of 60 percent savings off of OEM support list prices. However, depending on the equipment type, location and product density, Gartner has seen that range of savings with TPM contracts is 50 percent off OEM list up to 95 percent off OEM list,” Gartner says in its Competitive Landscape report. Once you’ve reached the point of planned obsolescence, TPM programs are a smart alternative that feature several benefits. Don’t pay for what your company doesn’t need. Don’t pay for what’s not coming. Don’t pay for what’s free. The great thing about TPM is that no matter what kind of equipment your company uses, new or pre-owned, TPM is a strategic and well-established way to get the quality coverage you need while saving money that can be used on other high-priority needs in your infrastructure. Life cycle management is the commitment your organization makes to maximizing value at every stage of your company’s technology investment. It’s the way your organization rethinks how to build, maintain, support, and upgrade your technology infrastructure. When viewing technology investments as a life cycle, with each step containing strategies to maximize value, it’s much easier to create a blueprint for success every time. The goal is discovering creative ways to recover value at every step of your organization’s journey — without sacrificing quality or your peace of mind. Complete life cycle management is a smart way to become more agile, resourceful, and proactive at recovering value throughout the life of your technology infrastructure. With a true life cycle management strategy, your organization can rethink how to approach every technology project and redefine the expectations of what your technology can do for you and your company. Author’s Note: Part one of my series, “Hardware life cycle approaches to save money, ensure network reliability” can be found here. Frank Kobuszewski is vice president of the technology solutions group at CXtec.